True base receivers are few and far between, some have simply evolved from the hand held equivalents with little tangible improvement in performance or facilities over their smaller counterparts - the AR5000 is not like this! High performance, top quality build and true wide coverage all mode receive. The AR5000 +3 advances the frontiers of performance providing excellent strong signal handling, high sensitivity and wide frequency coverage with microprocessor facilities to match including 5 independent VFOs, 1000 memory channels, 20 search banks, "Cyber Scan" fast scan & search rates, alpha-tag memory & search banks, frequency offset, step adjust and auto-mode tuning to name just a few. AOR have been synonymous with pioneering receiver design from many years and this tradition continues with the all new AR5000. A great advancement in wide band front end design has been made, partly due to the introduction of automatic electronic preselection between 500kHz - 999.999999MHz with low pass, band pass and high pass filters for other bands. The preselection may be "manually tracked" when monitoring spot frequencies to help reduce any potential effects of interference caused by nearby monster transmitters. A TCXO forms the building block which is fitted as standard to ensure a very high degree of stability, provision is made to feed the AR5000 from an external 10 MHz reference signal should one be available (commercial organisations etc). A Numeric Controlled Oscillator (NCO) provides smooth tuning with steps right down to 1Hz. 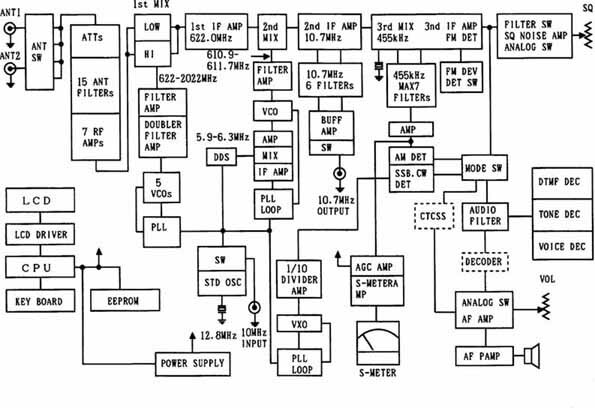 The receive circuitry is a triple conversion superheterodyne with I.F.s' of 622MHz, 10.7MHz & 455kHz. Multiple switchable I.F. bandwidths are available in both the 10.7MHz and 455kHz I.F. stages: 3kHz, 6kHz, 15kHz, 30kHz, 110kHz & 220kHz with provision for an optional 500Hz Collins mechanical filter. The AR5000 plus3 is housed in a newly designed solid metal cabinet and is powered from the supplied external 12V d.c. power unit but may be operated from any regulated supply or battery capable of providing 12-16V @ 1A. Aerial input is via a high quality N-TYPE connector with a second SO239 connector which is switchable manually or automatically from the front panel. A switchable preamplifier is employed (below 230 MHz) plus a switchable 10dB attenuator, this may be configured as "auto" so that the receiver selects the optimum setting automatically. The 1000 memory channels (10 banks x 100 channels), 20 search banks with auto-memory store and a total of 2100 PASS frequencies are provided with data stored by EEPROM so that no external supply, battery or capacitor is required for data retention. Scanning and search speed is a very respectable maximum of 45 channels or increments per second in "Cyber Scan". A meaningful & detailed auto-mode band-plan has been pre-programmed (specific to each market area) so that operation is straight forward and quick. Should you wish, auto-mode may be easily cancelled by selecting a different step size or mode. A special Frequency Offset facility plus step adjust has been provided to simplify DUPLEX frequency monitoring and for tracking unusual band plans. A wide variety of search and scan types are available including memory scan, select scan (your temporary favourite frequency notepad! ), mode scan, bank scan, pause scan, search bank link etc. The squelch too may be configured for noise, signal level, audio level etc. Audio low pass and high pass filters may be configured and are switchable around the following frequencies: LPF 3kHz, 4kHz, 6kHz & 12kHz, HPF 0.05kHz, 0.2kHz, 0.3kHz & 0.4kHz. De-emphasis is also selectable: THRU, 25uS, 50uS, 75uS & 750uS. 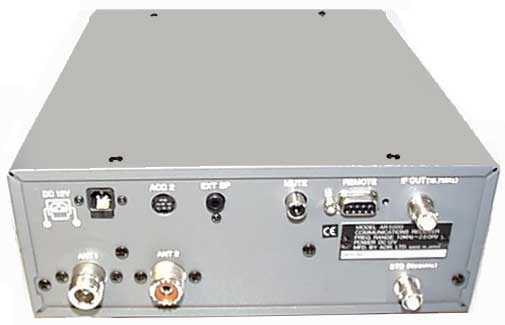 A DTMF decoder is provided to display DTMF characters in use with an optional CTCSS board to display the CTCSS frequency. 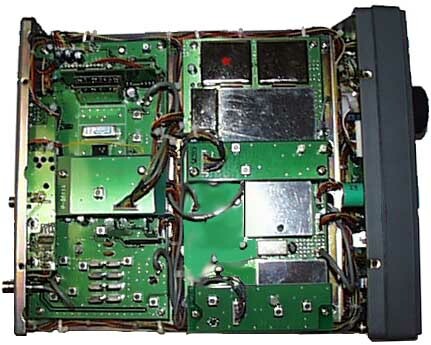 A front panel accessory socket provides audio break-out / return for use with external signal processing units, detector output and audio output with switching control for tape recorders. A large rear illuminated segmented liquid crystal display provides a wealth of operating detail including frequency, mode, AGC, etc but also displays up to 8 alpha-numeric text characters so that comments may be entered to accompany memory channels & search banks to aid easy identification and retrieval of data. Two tuning controls are provided: the main knob provides tuning steps from 1Hz to 999.999kHz and has mechanical variable torque adjustment ideal for fine tuning such as SSB applications, the second is click-indented ideal for channel tuning and provides switchable step sizes of 100Hz, 1kHz, 10kHz, 100kHz, 1MHz and x10 for rapid tuning. An analogue S-meter provides easy to see relative signal strengths. Other useful facilities include a built-in dual time clock 12hr/24hr with On/Off timer, sleep and alarm, variable beep tone... plus much, much more! Extensive facilities are available via the RS232 port which is standard on the AR5000+3. Even the volume and squelch controls may be remotely controlled. Output terminals are provided for an external speaker, headphones & transmit mute. Provision has been included for an optional built-in signalling unit, external aerial switching unit plus CTCSS and other decoder options. The AR5000 is ready to plug straight into the optional SDU5000 spectrum display unit for "real time" band occupancy evaluation and measurements in both frequency and dBm signal level. The 10.7MHz I.F. 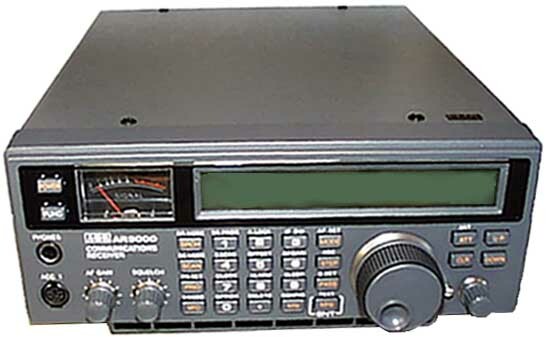 output of the AR5000 has a suitable 10MHz bandwidth ideally matched to the SDU5000. (Note: a microprocessor upgrade may be necessary to the SDU5000). Dimensions: 8.5x3.5x10 inches (217x100x260 mm). (2GHz). Supplied with 15m of coaxial cable and terminated in a BNC plug. 15m of coaxial cable and terminated in a BNC. 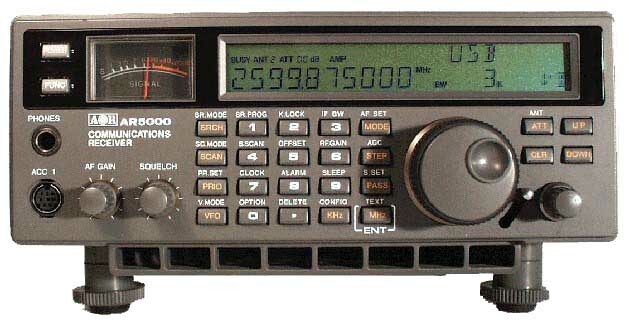 The enhanced AR5000+3 has been awarded 4-stars by Passport to World Band Radio’99. "Front-end selectivity, image rejection, IF rejection, weak-signal sensitivity, AGC threshold and frequency stability all superior". "Unlike virtually every other receiver we have tested over the past 21 years, the frequency readout is unfailingly accurate to the nearest Hertz. This should make the AR5000+3 of exceptional interest to broadcast engineers". Voted best wide band receiver by the readers of the German "Funk" magazine. "Throughout the wide frequency range, the receiver was adequately sensitive, especially so at the upper end, with good overall strong signal handling characteristics." position for 500 Hz CW. (30 kHz is ideal for WEFAX). Synchronous AM is a useful tool to help reduce distortion due to selective fading, in particular on the short wave bands (long & medium wave bands too). In synchronous AM, the original carrier is phase locked to a stable internally generated synthetic reference which is used to replace the (variable) original carrier resulting in more stable reception with greater recovered audio, especially during deep fades. A wide lock rage is provided by this detector to enable simple, quick & efficient operation (unlike some other synchronous units on the market which require extremely accurate tuning). AM transmissions are constructed of a carrier and both upper & lower sidebands. Usually both side bands carry the same information so both or either may be selected with the same recovered resulting audio, however when adjacent interference is present, selecting synchronous single side band (SAL or SAH) can provide improved results. Automatic frequency control is a 'global' facility, either OFF or ON (default is off). When A.F.C. is used in AM, FM and synchronous AM modes, the receiver is automatically tuned on to the centre frequency to provide the best signal strength and recovered audio. When used in synchronous AM modes, A.F.C. ensures that the signal is pulled within lock range for no-fuss operation. A.F.C. 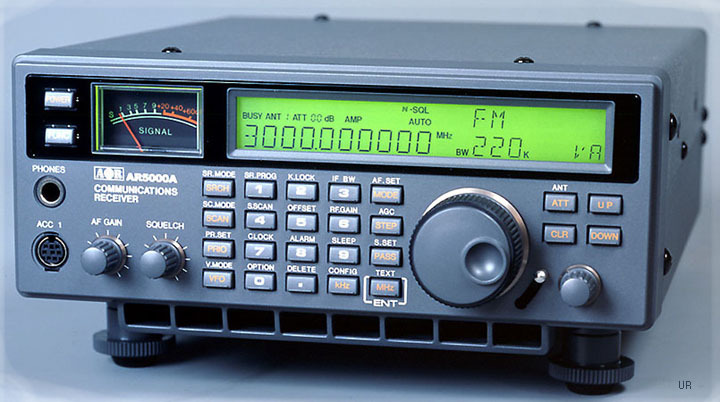 is particularly useful on the VHF-UHF bands to ensure that the AR5000 is receiving spot on frequency, especially when searching through unusual band plans or when the exact band plan is not known. Te noise blanker is another a 'global' facility, either OFF or ON (default is off). This facility is particularly useful to help reduce impulse noise and interference from vehicles ignition systems, whether from passing traffic or while the AR5000 is fitted into a mobiele installation. WITCHED EPROM BANKS - 2,000 memories!!! The facility of switching EPROM banks is now supported, this virtually means that the AR5000 now has 2000 memory channels, 40 search banks, 10 VFOs etc... two sets in one!